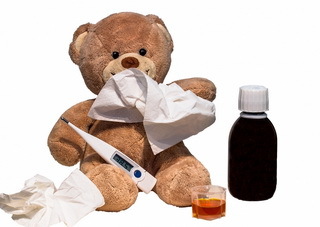 Seasonal flu or influenza, together with common cold, is one of the most common viral diseases in the world. It is typical for the season between November and March. The culprit of this disease is the influenza virus, which passes fairly easily from one person to another. Flu is a respiratory infection. It affects the nose, the throat and the lungs, causing several different symptoms. Compared to another viral respiratory disease, common cold, flu is more serious. It is estimated that 30.000 people die each year from the complications of seasonal flu. The intensity and the duration of flu symptoms vary from person to person and they also depend on certain factors, such as the age and overall health. Elderly seem to suffer more from flu and they should be closely monitored for complications. Fever and chills are among the most commonly manifested symptoms of flu. The fever is usually high, especially in the afternoon and in the evening. Another common symptom is sore throat. The itchiness, dryness, irritation and pain usually start two or three days after the infection has occurred. The pain is particularly present while swallowing, which may lead to the loss of appetite. Most people also suffer from nasal congestion and runny nose during flu. There is a lot of sneezing, the discharge is initially watery although later it turns thicker and yellowish, and the nose feels stuffy. There may also be some chest congestion. Flu also causes dry coughing, which can be mild or severe. Dry coughing means there is no discharge. Most people associate flu with fatigue and muscle ache, which is one of the most typical flu symptoms. Joint pain and headache are also present in the majority of cases. Flu can also cause stomach problems, such as nausea, vomiting, diarrhea, abdominal cramps. There is no typical medication for seasonal flu, because it is caused by a virus. There is absolutely no point in taking antibiotics because they only work on bacteria. However, there are things than can bring relief from the symptoms of flu. It is important to rest as much as possible, to eat well, especially foods rich in vitamins, and to drink plenty of fluids. Hot beverages, fruit juices and soup are particularly recommended. As for the over-the-counter drugs, decongestants and nasal sprays help with stuffy nose, cough drops can be taken to relieve the coughing and mild painkillers and antipyretics help with muscle ache, joint pain and fever.